That's right, the classic. Like Frogger or Lord of the Flies. Like the Volkswagen Beetle or The Beatles. Classic--something of enduring interest. I'm breaking out the tried and true peanut almond butter and jelly sandwich to remind those of you who haven't yet told me your favorite dish in which to use nut butter to hurry up and do so. There're five free jars of Barney Butter on the line here! What, you want a recipe? Your wish is my command. Slather Barney Butter on one slice of bread, and spread the jelly out on the other. Put the pieces of bread together such that the Barney Butter gives the jelly a big ol' smooch. Cut in half for easier consumption, and enjoy. Wow!Yummy pic Grace!One of my favorite sammies! MMMMMM....what a lovely picture!!! Looks so yummie:)!!! Mmm - my favorite jam is raspberry with the seeds. Although I also got this delish strawberry rhubarb one time that was so tangy and delightful! My favorite! I think I need to make one this weekend. Almond butter on whole wheat -- I may have to change what I said was my favorite use of nut butter. That is one great shot Grace! Love, love, love almond butter. Your photo makes me want one of those right now! Looks like a perfect PB&J and I've got to find me some of that Barney Butter! Now, Im craving one! Unbelievable how appetizing you made that look! Weird but true I don't like PB&J! Perhaps I would if I tried it with barney butter and your apple cinnamon jelly? Alas I have neither of those so I guess it's no sandwich for me. Man, I was the Frogger champion in my day, if I can take a moment to brag. As for your sandwich, it looks delish - as a PB sandwich always does in my eyes (even though this isn't technically peanut butter). I'm so glad you broke out this classic. It deserved to be posted about. Talk about one of life's best comfort foods. 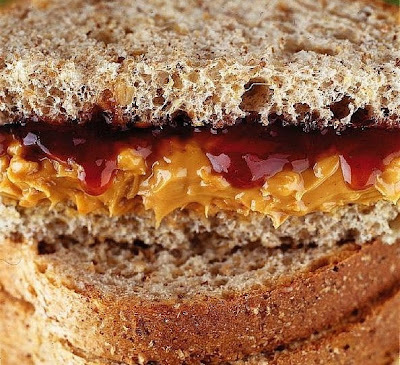 Those nut butter and jelly flavors sandwiched between great, hearty bread. Well, there's just not much better! That would be good for my lunch, yum. I literally have a peanut butter and jelly sandwich EVERY day. Looking at this picture, I know why. now that's a good photo! A nut-butter recipe of mine you might like. I'd be sure to make it with the Barney Butter also. Lately I've really been diggin' blackberry jelly. It's darn tasty. Bravo my dear, these is absolutely nothing wrong with a good old PBJ.. Yours looks sticky and gooey, just the way I like it. That sammie is a hunk of burnin love Grace! mm. i've never done the apple cinnamon jelly. that sounds so good! That is one fantastic photo! Wow...I didn't have nut butters on my mind before I clicked over here but now I sure do! Great job on the sandwich photo! I always think sandwiches are difficult to capture but yours looks exceptionally yummy. I like PBJ the old fashioned way, soft white bread, grape jelly, and Jiff. But now that I am all grown up- wheat breat, natural PB, and homemade strawberry jam! Great photo BTW! Part II; grill that PBJ up in butter & I'm in! Now you are making me crave: Peanut butter, honey and plain potato chip sandwich - it's my very favorite. If you ever want to hear a funny debate between kids, bring up the "what is the proper way to make a PB&J?" question and enjoy their heated preferences. Great pic, I could reach over and take a bite! You don't have to be six to want to sink your teeth into that beauty of a sandwich! Hey, you have some awards waiting for you over at my site! Great shot of that ab&j sandwich! Your picture is fantastic. I love apricot preserves with almond butter on whole wheat. My favorite is nut butter with bananas, honey on whole wheat! YUM! Great photo!! A great shot! This is definitely a classic! OH MAN! I love that picture! I want to make a giant poster of it and put it on my wall. Oh man, I want some of that ooey gooey goodness! you mae PB and J look stunning! This looks so elegant for a classic as pb&j. Perfection on a plate! Peanut butter and jelly is the best thing ever. It's even better than Mac and cheese. I literally gasped out loud in delight when I saw the photo! that looks fantastic, I've never had apple cinnamon jelly but it sounds so good. Grace...Please stop in for a visit, I have something for you! Every nook and cranny of this delicious sandwich says "Eat me." PBJ is one of the best things in life, period. The wheel? Take it or leave it. The PBJ? Take it. I grew up with PB and golden syrup (like corn syrup) rather than PBJ, but as with all classics, the basic goodness can withstand a little alteration :) Love the idea of making a PBJ with other nut butters - and that photo is just to die for!